LOS ANGELES, CA--(Marketwired - November 29, 2017) - Today, Nissan unveiled six Star Wars-themed show vehicles at the Los Angeles Auto Show in celebration of the brand's ongoing collaboration with Lucasfilm for Star Wars: The Last Jedi. The show vehicles are a dramatic display to highlight Nissan's expressive designs and the famous characters and crafts from the upcoming film, debuting in theaters Dec. 15. "We're back this year collaborating with Lucasfilm and the artists at Industrial Light & Magic to create these amazing concept vehicles across some of our best-selling models," said Jeremy Tucker, vice president, Marketing Communications & Media, Nissan North America, Inc. "These show vehicles were created for our fans, and will be unveiled at the Los Angeles Auto Show and shared across the country in regional auto shows over the next several months." 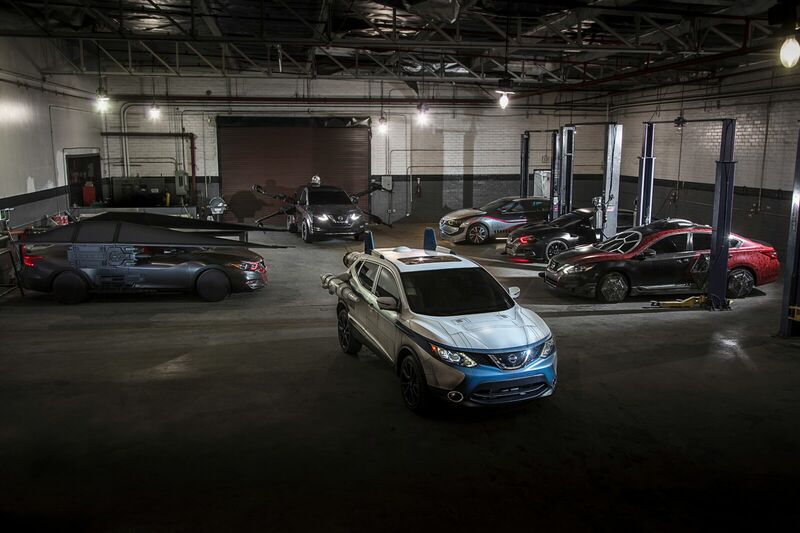 Beginning with the expressive lines of some of Nissan's most popular models -- Rogue, Rogue Sport, Altima and Maxima -- Star Wars: The Last Jedi themes for each vehicle were developed from artists inside the hallowed offices of Lucasfilm, whose team penned the designs, guiding colors, textures and graphics pairing the vehicles with a craft or character from the film Star Wars: The Last Jedi. Each concept -- not available for purchase -- receives a unique approach, including extras such as hydro-dipped graphics, surround sound and aged exterior design to show simulated use in battle. With designs complete, the legendary Hollywood vehicle fabricators at Vehicle Effects in Burbank, California, brought the sketches to life. The Special Forces TIE Fighter is a strike fighter used by the First Order's elite Special Forces pilots. This is fittingly recreated using Nissan's best-selling sedan, Altima. The show vehicle features custom body enhancements, bringing it in line with a member of the First Order's fleet. The vehicle's standout feature is the cockpit window that brings the multi-paned look of the Special Forces TIE fighter to the Altima's windshield. Custom wheels and full-body wrap bring the dual-winged spacecraft to life. Speakers at each corner recreate the iconic TIE Fighter and blaster sounds, creating a true sense of motion. Each wheel features the centerpiece of a TIE Fighter wing applied through a hydro-dipping process. Drawing on the existing aggressive design language of the Maxima, this show vehicle is transformed into a truly sinister sedan. Designers merged Kylo Ren's unmistakable black and silver facemask with the Maxima's V-motion design language using a single block of milled aluminum for the front of the 4-Door Sports Car. A custom front lower spoiler, impactful hood and body are coated to exacting character color-matching specifications. The project is completed with a set of red signature headlights and underbody lighting that pulse at random -- similar to Kylo Ren's crossguard lightsaber. Engineered for speed and astute handling capability, the Nissan Maxima is the perfect car to replicate Kylo Ren's TIE Silencer -- one of the new crafts to appear in Star Wars: The Last Jedi. This one-off TIE Silencer is customized to Kylo's specifications with laser cannons and missile launchers affixed to the vehicle's distinct wings -- stretching the entire length of the car. Crimson lighting in the grille and underneath give this concept an amazing true-to-life feel. Sound effects pulled directly from the movie take this one to the next level, truly blurring the lines between fantasy and reality. Also joining the First Order ranks, the Captain Phasma Maxima is covered in high-gloss silver armor and bears an unmistakable mask of the strong female character in the film. Its fascia and hood are each hand-crafted from aluminum. A red accent line runs the length of the car, with ground effects to further its intimidating look. The Captain Phasma Maxima is also a celebration of female strength. Nissan's Maxima team is led by a female engineer, the designer for this vehicle was a female from ILM, the vehicle's brand director is a female and the vehicle was created to celebrate one of the toughest female warriors in the galaxy. Poe Dameron's X-wing leads the New Republic starfleet, with massive fixed wings spanning either side of its Nissan Rogue foundation. Ready for action, the T-70 X-wing starfighter features a pair of illuminating thrusters, while quad laser cannons integrated into each wingtip make the craft ready for battle. Sitting atop the crossover is a full-size BB-8 astromech droid with functioning lights, motion and sound. A rugged tire and wheel package draws parallels to the rugged valor of the Resistance. Quick and nimble, the A-wing is a perfect fit for the Rogue Sport it is built upon. Dual thrusters at the rear of the vehicle are illuminated, while top-mounted fins mimic the A-wing's design. Its wheels are painted blue to match the craft's accents with new tires fitted to provide a wide stance. Laser cannons flank the vehicle and a detailed wrap complete with battle damage prove it's a vehicle ready for almost anything. Nissan is a global full-line vehicle manufacturer that sells more than 60 models under the Nissan, INFINITI and Datsun brands. In fiscal year 2016, the company sold 5.63 million vehicles globally, generating revenue of 11.72 trillion yen. Nissan engineers, manufactures and markets the world's best-selling all-electric vehicle in history, the Nissan LEAF. Nissan's global headquarters in Yokohama, Japan, manages operations in six regions: Asia & Oceania; Africa, Middle East & India; China; Europe; Latin America; and North America. Nissan has a global workforce of 247,500 and has been partnered with French manufacturer Renault under the Renault-Nissan Alliance since 1999. In 2016, Nissan acquired a 34% stake in Mitsubishi Motors, which became the third member of the Alliance -- a grouping with combined annual sales of almost 10 million units a year. Nissan unveiled six Star Wars-themed show vehicles at the Los Angeles Auto Show in celebration of the brand's ongoing collaboration with Lucasfilm for Star Wars: The Last Jedi.